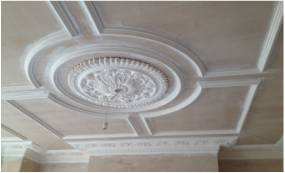 Classify architectural Georgian coving and Georgian plaster cornice, in terms of the use of form, techniques, materials such as gypsum, (plaster of Paris). Doric time period, region and other stylistic influences. It overlaps with, and emerges from the study of the Greek Doric evolution and history of Georgian coving architectural plaster mouldings. In architectural plaster mouldings history, the study of Georgian architecture, for instance, would include all aspects of the cultural context that went into the plaster coving design and construction of these structures. Hence, architectural Georgian plaster mouldings styles is a way of classifying architecture that gives emphasis to characteristic features of design, leading to a terminology such as Greek Doric & Georgian plaster coving styles.